One of the best ways to entice potential customers to check out your food and drinks business establishment is through the use of creative marketing tools. But aside from that, ensuring that you have great quality customer service and the perfect chill ambiance will surely help in making sure that customers always come back. By definition, a bar is a counter, room, or establishment at which food or especially alcoholic beverages are served. In relation to this, you need to make sure that potential customers are intrigued by what you offer by setting up the mood or vibe you are going for with all your materials. 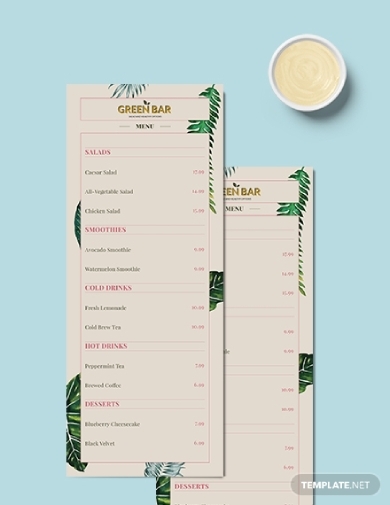 Having a menu template that lists all that the food and drinks that you offer along with its corresponding price ensure that there is transparency and efficiency when ordering from your establishment. In this example, various bar menu templates and examples are provided for your perusal. Do you have a beer bar that offers exquisite beer imported from foreign countries? Then, marketing may be easy for you. The products that you offer in itself will immediately capture the interest of interested customers especially beer enthusiasts. However, you still need to have a bar menu that will clearly provide information about everything that you have to offer. 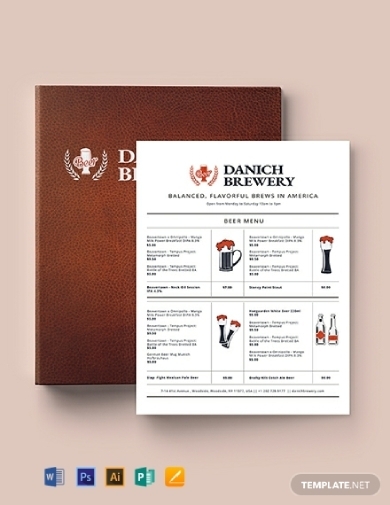 If you are looking for a high-quality template that you can easily edit and use, you can download this beer menu template from this article. Nowadays, it is totally profitable to invest in a bar that only offers healthy food and drinks options that are perfect for people following a strict diet regimen. With that in mind, a green bar means you only offer healthy and organic food and drinks to your customers. You need to have a menu that presents all of those to your customers and even to potential customers. You can have a separate salad menu, smoothies menu, etc. so long you’re able to comprehensively present what you have to offer. Although the word bar connotes that the establishment only offers alcoholic beverages, most bars also offer food that pairs perfectly with the cocktails and various drinks that they offer. 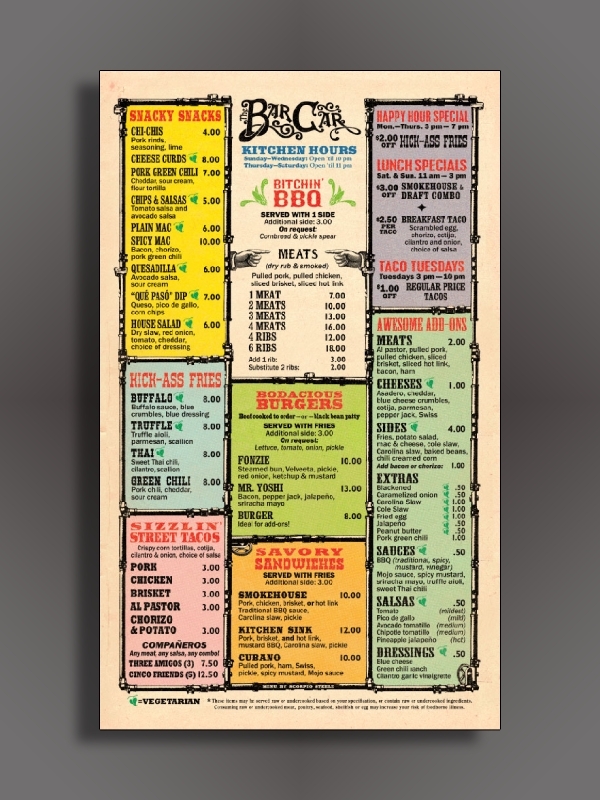 To help customers easily and more efficiently scan through the menu, it is best to have a separate menu for the available dishes, hence, this bar food menu. Looking at this example, you will easily see the various dishes that the bar has to offer along with the specific serving size of each dish. 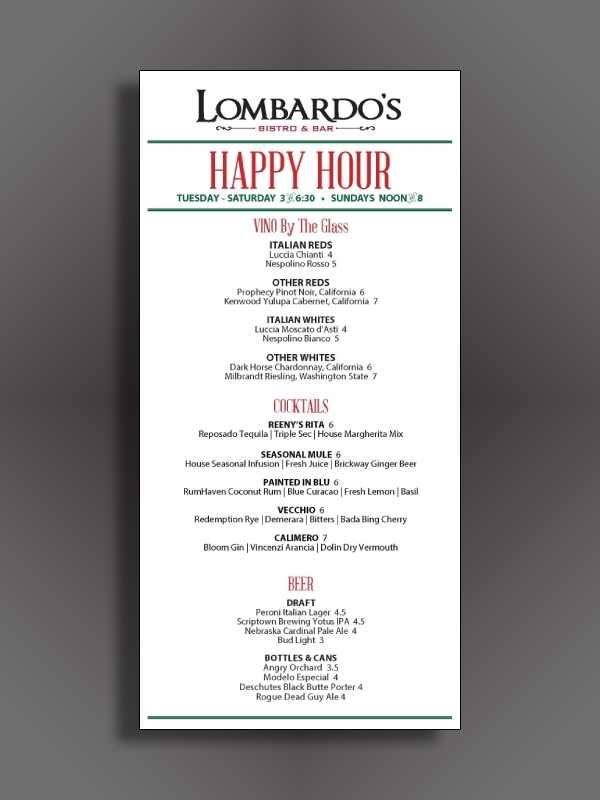 The term Happy Hour was used early in 1913 that meant a scheduled period of entertainment; in this sense, the food and beverage industry has made use of that term to offer special promos and deals to cater to their customers. Bars usually offer a happy hour promo on certain days and hours which gives quite a huge discount on all the food and drinks in the establishment. 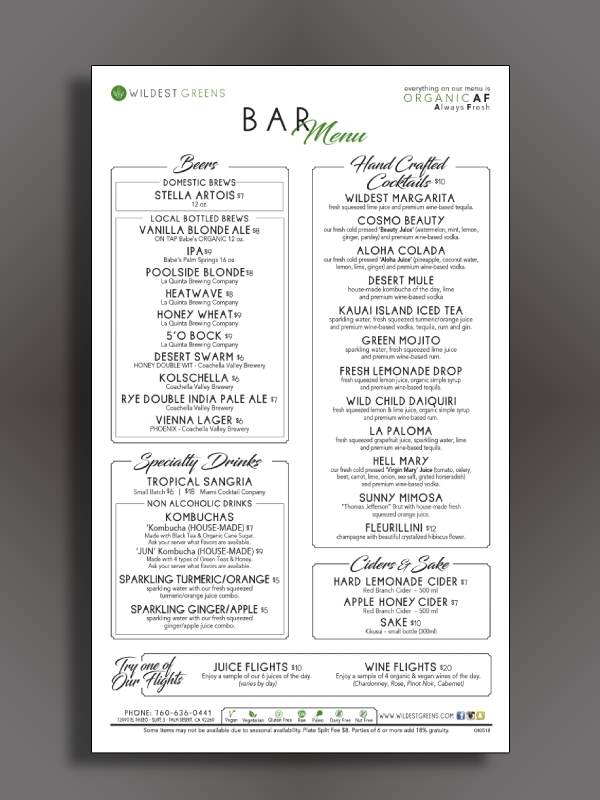 If you are planning to incorporate that gimmick in your bar business, you can take inspiration with this happy hour drink menu. It is a known fact that people in the Wild West drank strong liquor since it has been known to be a place where brawly cowboys, gunslingers, and saloon madames were together in one place. Thus, using a Wild West theme is truly right and appropriate. 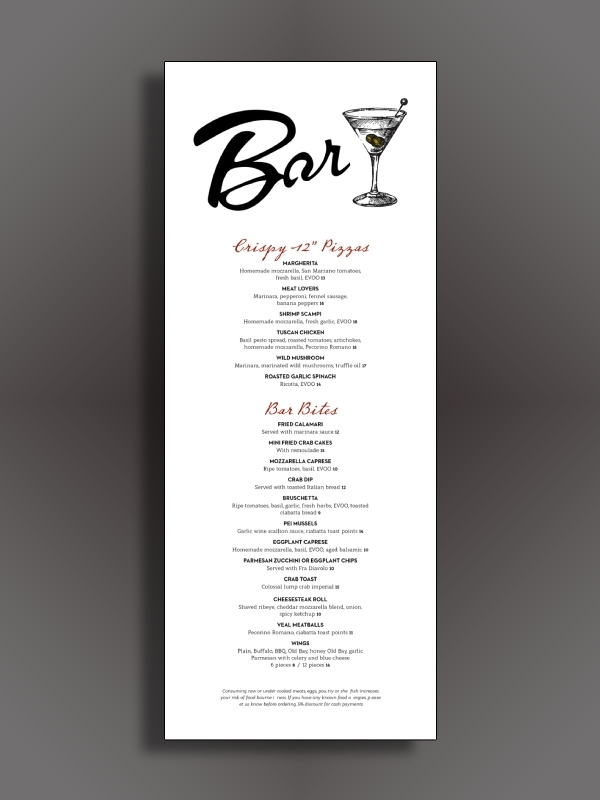 However, you need to remember that using this design on a bar menu means you need to incorporate all or most of its elements. You need to make sure that your menu is still clear and easily understandable despite quite a messy layout similar to this menu example. People nowadays have become conscious of the food and drinks that they consume. That’s why there are quite a few healthy food establishments like juice bars in the market today. If you are planning to invest in that, you need to have a menu that will cater to healthy diets at a reasonable price. Looking at this example, you can see clearly how each type of dish is separated neatly for a better browsing experience for the customer. You can use this menu example as your guide in order to achieve a high-quality layout and impressive finish for your business menu. Aside from healthy food and drinks, people have become obsessed with coffee. Some people need to drink coffee first before they can function properly at work; thus, having a coffee bar that offers exquisite brews will surely become a hit to the market. 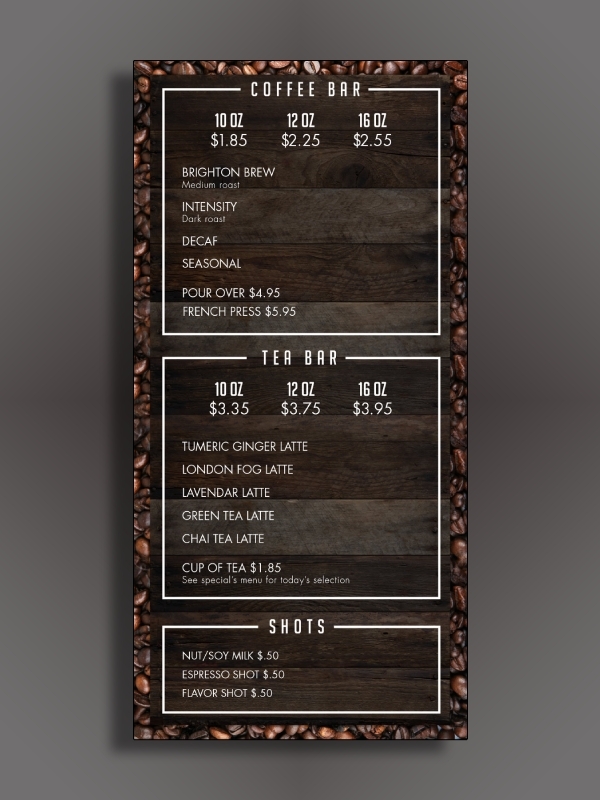 With that in mind, you need to have a coffee bar menu that lists all the brews you offer along with the corresponding price. In addition to that, you can also include other caffeinated drinks that you offer for non-coffee drinkers; you can systematically separate each type of drink like in this example.